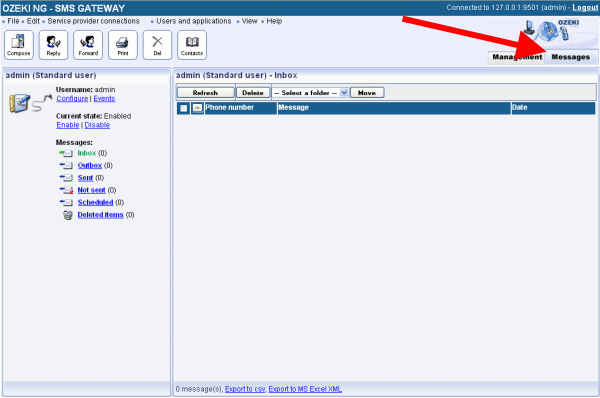 On this page you will find detailed information on the available features of Messages view in Ozeki NG SMS Gateway. The possible message boxes are listed and their functions are detailed in the article. 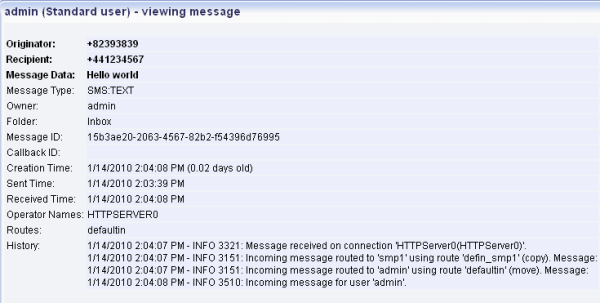 Beside "Management Console", the other main view is "Messages" in Ozeki NG SMS Gateway. You need to click on "Messages" on the top right corner of the interface to get this view (Figure 1). In this section you can find all the options that are needed for sending and receiving SMS messages. The main menu is also available at the top left corner of the interface. On the left hand side of the interface you can see the username (in this case it is the admin user) and the current state of the user (Enabled). Under "Current state" you can enable or disable users. Still on the left hand side, there are the message boxes of the user: the Inbox, Outbox, Sent, Not sent, Scheduled, and Deleted items. Inbox: If there is an incoming message you can see it in the Inbox folder (Figure 2). By clicking on the incoming message you can see the details of it. Thus the phone number of the sender and the recipient, the text of the message, and further details are included in the message such as the time of sending and receiving (Figure 3). You can still have further information if you click on "View message details" option at the right hand side (Figure 4). With this option information such as Originator, Recipient, Message Data, Message Type, Owner, Folder, Message ID, Callback ID, Creation Time, Sent Time, Received Time, Operator Names, Routes, and History will be available about the message (Figure 5). Outbox: The outbox stores the messages to be sent. In practice it means that messages are stored here before they are sent out to the recipients. Sent: In this folder you can track back your sent messages. The details of messages are also available in this option, as well. In this way you can easily follow and preview your messaging process. Not Sent: Messages that are cannot be sent because of any failure are stored in this folder. Such a failure can be if the phone number of the recipient does not exist. In these times messages cannot be forwarded. Scheduled: This box contains messages that are scheduled for sending in a predefined time. This time can be set when you compose your message. The messages are stored in this folder until this specified time. In the specified time the message is sent out to the recipient.